We’ll begin this little trip with John Henry Graham. John Henry Graham was born somewhere in Texas on Sunday, 8 May 1870 to Jesse and Sarah Graham, just five years after Texas was re-admitted to the Union following the American Civil War. By the 1880 census, the Graham family had settled in Bear Creek Township in Searcy County, Arkansas. Wednesday, 2 October 1889, with his brother-in-law James Newton Siler Watts as security, John paid $100 to Searcy County to secure a bond of marriage to Mary Matilda Bohannon (born Thursday, 29 July 1869), daughter of William Cornelius Bohannan and Mary Ann Sikes of Sulphur Springs, Searcy, Arkansas. 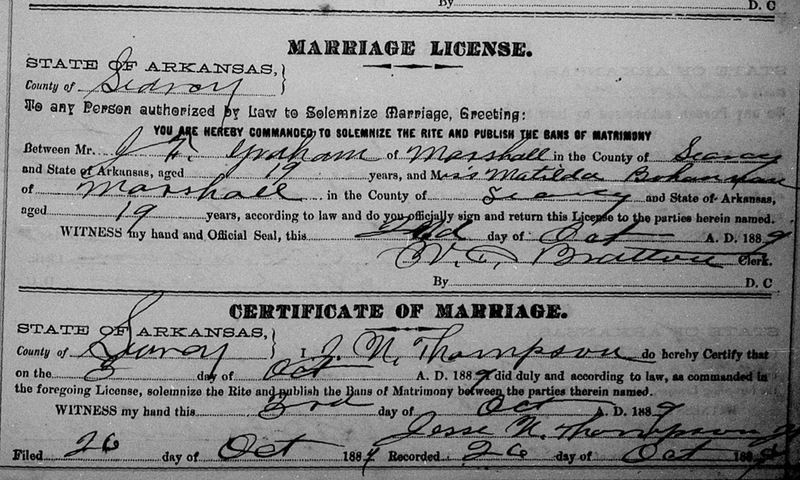 John and “Tildy” were married on Thursday, 3 October 1889 by Justice of the Peace Jesse Thompson. Bond for marriage of J.H. Graham and Matilda Bohannan, with J.N.S. Watts signed as security. The 1890 census was lost in a fire in 1921, and therefore no census data is available on this family for that year. Since John and Matilda were married just a few months before the census was enumerated, it likely wouldn’t offer us much data anyway. Wednesday, 17 September 1890, John and Matilda welcomed their first child into the world, a daughter they named Evisa Jane Graham. Friday, 22 July 1892, their first son was born. They named him Jessie Cornelius Graham. He was likely named for both of his grandfathers, paternal Jesse Graham and maternal William Cornelius Bohannan. Wednesday, 22 November 1893, John signed as surety on a marriage bond for Otha Allen King and his bride-to-be Mary Elizabeth Leming, who was Matilda’s first cousin once removed on the Sikes side of the family. John and Matilda’s second son, William Thomas Graham, was born on Tuesday, 20 February 1894. John Jasper Graham, the couple’s fourth child and third son, was born on Saturday, 18 January 1896. He may have been named for Matilda’s youngest brother, John Jasper Bohannon. Friday, 4 September 1896, John Henry signed his mark as security on the marriage bond for John Jasper Bohannon and his bride-to-be Florence Woods. Signature detail from the marriage bond of John Jasper Bohannan and Florence Woods, showing where J.H. Graham placed his mark of “X”. John and Matilda’s second daughter, Mary Adaline Graham, was born on Tuesday, 21 December 1897. The name Mary was likely taken from her mother’s first name. The 1900 census was enumerated in Red River Township by Eugene Arnold in June of 1900. It recorded that both John and Matilda could neither read nor write, but could speak English, they had been married for ten years, and had six children, however, only five were listed: Evisa, Jessie, William, John Jasper, and Mary. 1900 Census, Red River Township, Searcy County, Arkansas. John and Matilda’s next child, daughter Sarah Rosabelle Graham, was born on Saturday, 16 June 1900. The 1900 census included instructions to the enumerators to omit children born after 1 June 1900. That is why Sarah was counted, but not recorded by name. Tragically, the infant Sarah died on Sunday, 8 September 1901. Her life spanned an all-too-brief fourteen months. She was interred at Shady Grove Cemetery in Searcy County, Arkansas. Matilda was approximately three months pregnant when Sarah died. Five months later, on 16 February 1902, a Sunday, the Grahams would welcome the newest addition to their family, daughter Emma Dorothy Graham. Two years later, another daughter was added to the family. Stella Viona Graham was born on Thursday, 16 June 1904. Tragedy would strike again in 1905. On Monday, 16 October of that year, Mary Adaline died at the age of seven years and 10 months. She was interred at Shady Grove Cemetery near her sister Sarah. A few years earlier, John had applied for a tract of land under the Homestead Act, located at the “…southwest quarter of the southwest quarter of Section four and the east half of the southeast quarter and the southeast quarter of the northeast quarter of Section five in Township thirteen north of Range sixteen west of the Fifth Principal Meridian, Arkansas, containing one hundred sixty and fifty-four hundredths acres…” The General Land Office granted John’s land patent on Saturday, 17 August 1907, and John officially became a landowner. Later that year, their ninth child and last daughter was born. Her name was Nona Elizabeth Graham, and she was born on Saturday, 7 December 1907. 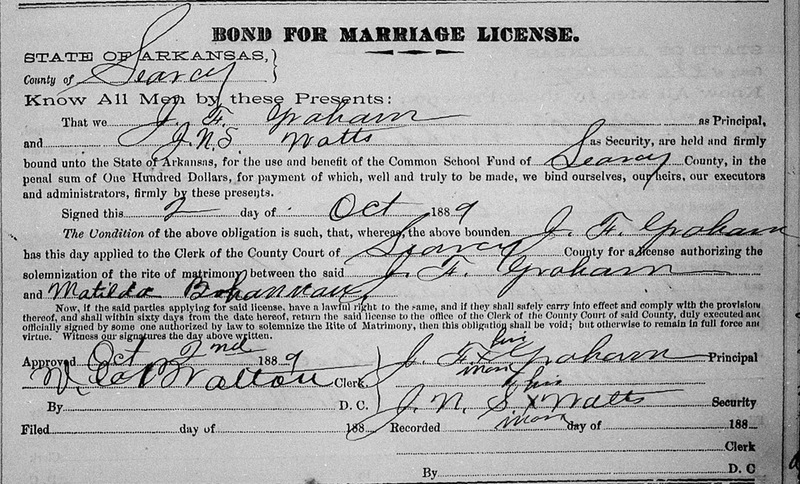 On Saturday, 23 May 1908, in the Probate Court of Searcy County, Arkansas, John signed as surety on a bond for his brother-in-law Patrick Bohannon. Patrick needed to have himself identified as his children’s legal guardian in order to claim an inheritance from their grandfather, Edgar Wilbanks. John and Matilda’s tenth and final child, Daniel Page Graham, was born on Thursday, 12 August 1909. 1910 Census, Red River Township, Searcy County, Arkansas. The 1910 census was enumerated in Red River on Monday, 2 May 1910. It recorded John and Matilda as the parents of ten children with eight living. This time it was recorded that both John and Matilda could read and write, so they must have learned sometime during the preceding decade if this is accurate. John’s occupation was listed as “farmer”, as was that of his three oldest boys, Jessie, William and John Jasper. Matilda and the rest of the children had no occupation recorded. 1920 Census, Red River Township, Searcy County, Arkansas. The 1920 census was enumerated in Red River on 27-28 January 1920 by Fredrick Houghton. It showed John and Matilda on the farm with four of their children: Emma, Stella, Nona and Daniel. John’s occupation was again “farmer,” while Matilda and the children had none. This time it was recorded that John, Matilda and all the children could read and write. Sunday, 30 August 1925, Thelma Drucilla Melton, daughter of John Henry’s sister Minnie, married Sylas Fredrick Rains. The name “M. M. Graham” was recorded on their certificate of marriage as a witness. It likely referred to Mary Matilda Graham, since the Graham farm was beside the Melton farm per the 1920 census. Rains-Melton marriage certificate detail showing Justice of the Peace H. D. Barnes and witnesses A. L. Barnes and M. M. Graham. 1930 Census, Red River Township, Searcy County, Arkansas. 1940 Census, Red River Township, Searcy County, Arkansas. This is the bottom of sheet 1A. 1940 Census, Red River Township, Searcy County, Arkansas. This is the top of sheet 1B. The 1940 census showed John and Matilda still on the family farm in Red River. Also recorded was their youngest son Daniel, his wife Blanche (Watts, daughter of William Marley Watts and Cordelia Mae Kimbrell), and their three children, Leroy, Janice and William. Daniel was apparently employed by his father, for his occupation was listed as farmer with total wages recorded for three weeks of work in 1939 at $30, a pay rate of ten dollars per week. John’s occupation was also farmer, and he and Daniel both worked 48 hours per week – that’s eight hours per day for six days followed by one day of rest. The farm was valued at $600. 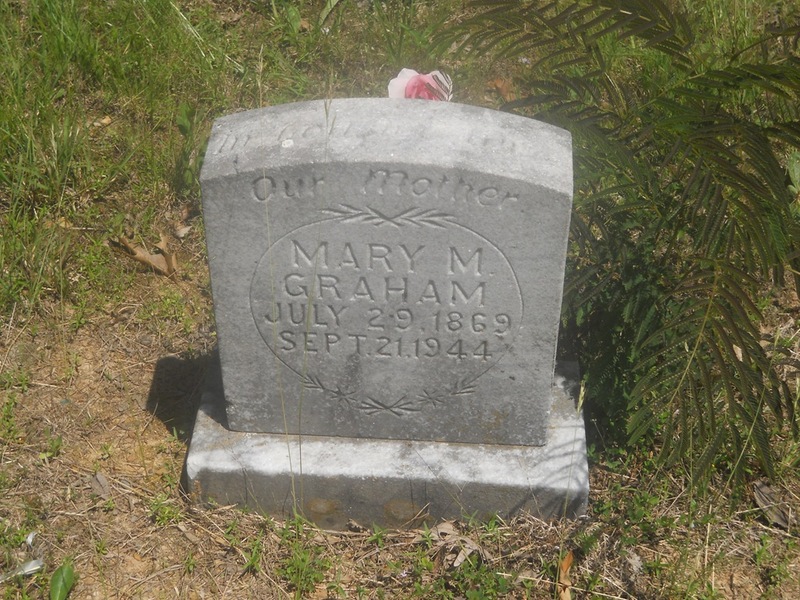 Grave marker of Mary M. Graham, Shady Grove Cemetery, Searcy County, Arkansas. On Thursday, 21 September 1944, Mary Matilda Graham, née Bohannon died at the age of 75 at the home of her daughter, Nona. She was interred at Shady Grove Cemetery, Searcy County, Arkansas. Her obituary was published in the Marshall Republican. On Wednesday, 24 April 1946, John Henry Graham died in his home in Red River at the age of 75. The funeral was conducted in his home the following day by Reverend W. L. Leach, pastor of the First Baptist Church of Marshall. John was interred at Shady Grove Cemetery, Searcy County, Arkansas. His obituary was published in the Marshall Republican on 3 May 1946. Grave marker of John H. Graham, Shady Grove Cemetery, Searcy County, Arkansas. Matilda’s obituary curiously referred to her by her maiden name, “Mrs. Mary Bohannon,” and also stated that she died at the home of her daughter. Furthermore, it stated that Matilda was a member of the Free Will Baptist Church, while John’s obituary reported a pastor from a different church, the First Baptist Church of Marshall, officiated his funeral. The date of John and Matilda’s marriage was given as 4 October 1888 in Matilda’s obituary. In John’s obituary, it was given as 8 August 1889. They’re both wrong. The obituaries are secondary sources recorded long after the actual event. For their true marriage date, we must look to a primary source document recorded on the actual day of the event: the certificate of marriage. It recorded that their marriage took place on 3 October 1889. Marriage certificate for J.H. Graham and Matilda Bohannan. Note the date of marriage was 3 October 1889. Click image for a larger view. 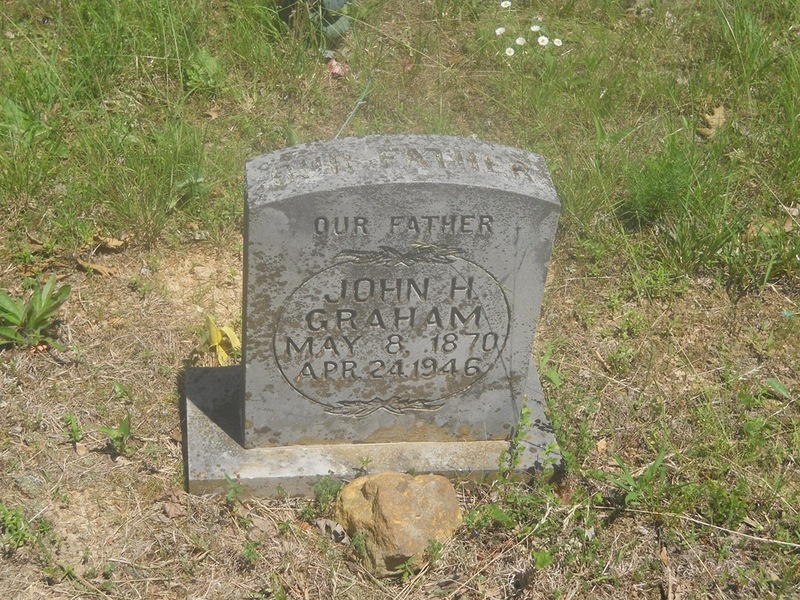 John had the following name variations in source documents: “Graham, John” on the 1880, 1910, and 1940 census; “Graham, John H.” on the 1900, 1920, and 1930 census; “John Hen Graham” in the Arkansas Death Index; “John Henry Graham” in his obituary; and “John H. Graham” on his land patent and his grave marker. His marriage document reads “J.H. Graham” but it’s indexed at Ancestry.com and FamilySearch.org as “J. F. Graham” because of the county clerk’s peculiar style of rendering an H.
A complete list of sources appears on Page 2.